Could Jesus Christ have taken human nature in its fallen state, like ours, yet lived His life in absolute sinlessness? Nineteenth century Scottish pastor Edward Irving lost his standing as an ordained Christian minister for communicating this truth. 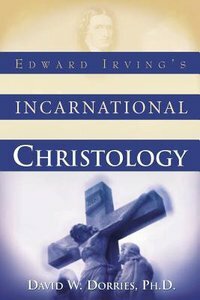 This precise Christological issue had never been debated officially in Christian history until Irving's time, yet he insisted that his teaching was not novel. He merely was restating the traditional doctrines of the ancient Church Fathers and Protestant Reformers. This volume brings to light the intriguing story of Irving's struggle to keep alive the true doctrine of Christ's fallen yet sinless humanity in an age of theological darkness. "Dr. David Dorries is an outstanding scholar and teacher. He is uniquely qualified to write about historic Christianity. I believe that his readers will be as enthusiastic about this material as his students are." "David Dorries is a gifted historian and teacher. He is in demand as a teacher on the history of revivals. I highly recommend his ministry to the Body of Christ." -DR.VINSON SYNAN,DEAN, SCHOOL OF DIVINITY, REGENT UNIVERSITY, VIRGINIA BEACH, VA.
About "Edward Irving's Incarnational Christology"
DR. DAVID DORRIES is a teacher, author, and minister. For nearly two decades, he has served on the faculty of the School of Theology and Missions at Oral Roberts University in Tulsa, Oklahoma. In addition, he and Mariela, his wife, co-founded Kairos Ministries International. Dr. Dorries offers seminars combining biblical insight and historical perspective in prophetic application. He earned his Ph.D. in Church History at the University of Aberdeen in Scotland (1987); his Masters from Andover Newton Theological School in Boston, Massachusetts (1974); and his Bachelors from Baylor University in Waco, Texas (1971). He has eleven years of experience in pastoral ministry.